I wish I knew why Longleys, on Sixth Avenue and 50th Street, billed itself with this title. But I can’t figure it out. The decor looks perfectly normal for a 1950s-era cafeteria: spotless floors, fake plants, salt and pepper shakers on every table. 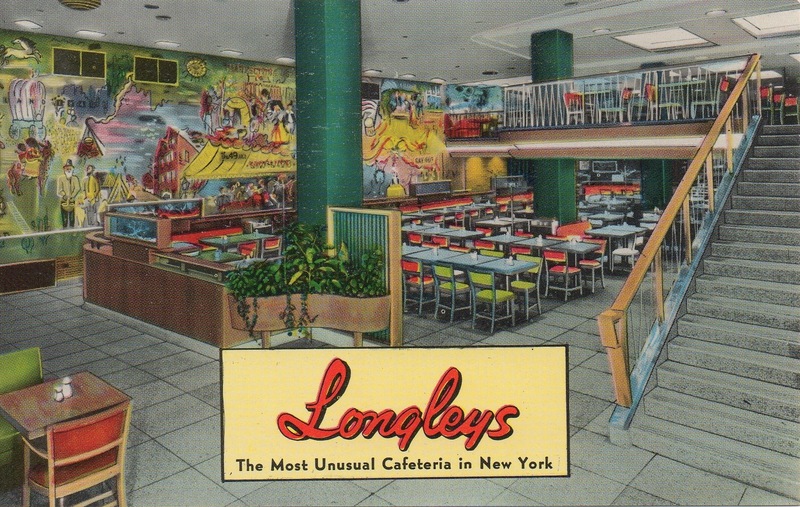 Longleys boasts of its “unbelievably fine food.” But they don’t specify any menu items—probably because the food wasn’t much different from what was served at the city’s other popular cafeteria chains at the time, like the President Cafeteria. Jack Kerouac memorialized Hector’s Cafe, near Times Square, in On the Road. Who memorialized Longleys? The only mention I found was in Jerry Stiller’s autobiography. When he first met his future comedy partner and wife Anne Meara, they slipped into Longleys for coffee and cake . . . and then lifted some silverware because Ann’s roommates in the Village kept losing theirs. When it shut down, I have no idea. But it must have been not long after the postcard came out. 1265 Sixth Avenue no longer exists; 1261 and 1271 are office towers built in 1961. This entry was posted on February 4, 2013 at 8:24 am and is filed under Bars and restaurants, Midtown. You can follow any responses to this entry through the RSS 2.0 feed. You can leave a response, or trackback from your own site. I swear I have eaten there. There must be an identical place still in existence. Same area. Owned by Asians and run as a salad bar primarily, with upstairs seating. Now I need to figure out where it is…. Here are a few references from Google books. Incidentally, other Google sites indicate that Longley’s was part of the Bickley empire. Love that first description of the moldy coffee. What would the high-end coffee fanatics of today’s gourmet New York do when faced with that? Thanks for digging this all up! Longley’s cafeterias were part of the Bickford’s chain–and, from the look of the postcard, slightly fancier. (The Bickfords that I remember were stark to the point of grimness.) 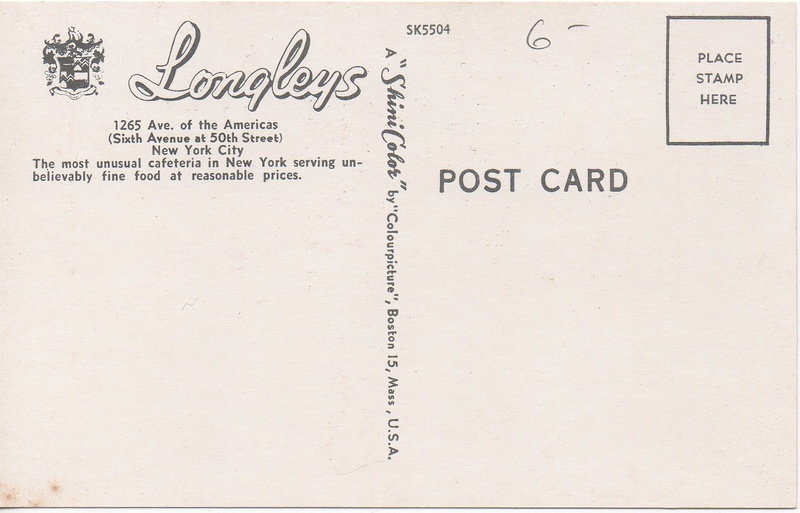 There were Longleys in Manhattan and Queens, and, oddly enough, in Baltimore. This one was operating as late as 1967.
ah, thank you! Lots has been written about Bickfords, but information about Longley’s is elusive. Just bought a book called f w dodge architectural bars, motels, restaurants. There is a whole spread on Longleys and the architecture.